At some point, you’re going to get tired of carrying around a full-size wallet. That’s where our buying guide showing you the best money clips for men comes in. We provide you a list of some of the most stylish and functional money clips for any occasion. 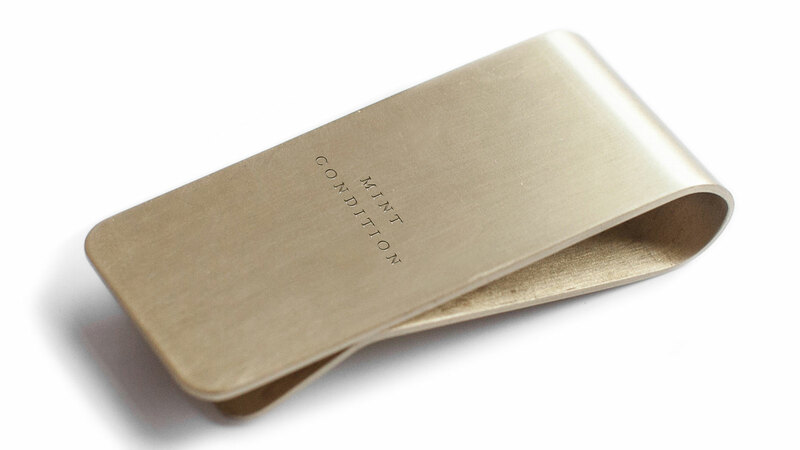 We start off with the Izola Mint Condition Money Clip, a beautifully simplistic clip at a great price. An underrated accessory that no man can really do without! Money clips are thankfully making a long-awaited comeback and when you see the stunning craftsmanship that went into creating this stylish money clip from Izola we think you’ll understand just why that is. The Izola Mint Condition Money Clip ($22) is perfect for your receipts, business cards, photographs and much more. A stylish money clip is something every man needs and yes they really can be used instead of a bulky wallet. Made with strong brass this money clip is bound to keep your money and other belongings safe and secure. It also comes with a gold foil stamped gift box as well, so it would make an amazing gift. Made with rich, luxurious genuine leather and available in a range of masculine colors the magnificent Le’aokuu Genuine Leather Magnet Money Clip ($13) would make a great gift for any man of today! With total dimensions of 11. X 1 x 8 cms and weighing just 0.06kg this money clip is ideal for carrying all your essentials. It’s also slim and sleek, has room to safely store up to six credit/debit cards, and has an ID window. This magnetic money clip is sure to make a practical and versatile gift. Looking for a great wallet for yourself? Then this stunning magnetic money clip from Shinola is exactly what you’ve been looking for. The Shinola Magnetic Money Clip ($150) is designed in Detroit and built by quality craftsman. 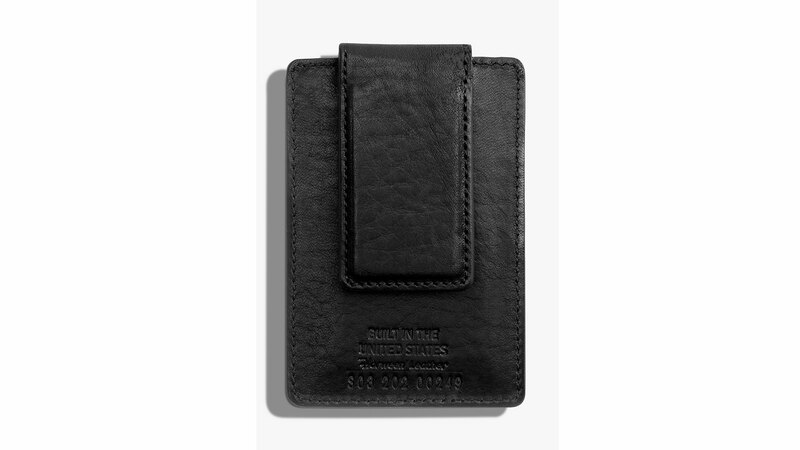 It is made from American leather and includes two credit card slots and a strong, secure leather wrapped magnetic clip. Plus it also comes in its own gift box so it is sure to make an amazing present for any occasion. 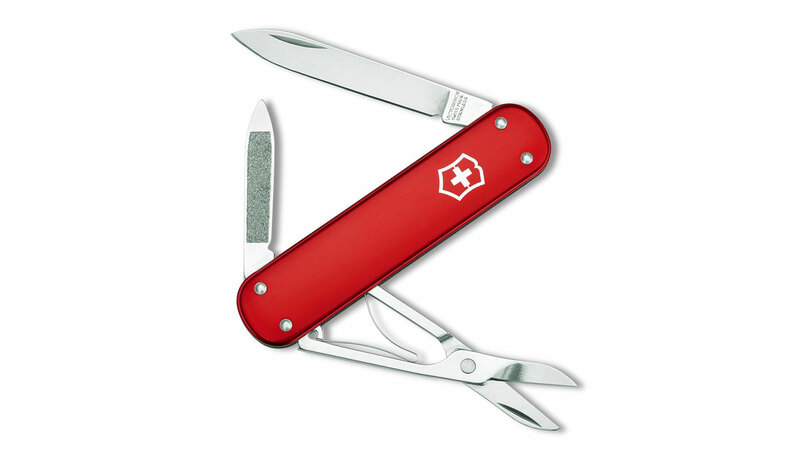 Available in three striking colors this stylish Swiss Army Knife doubles as a stylish money clip and much more! The Victorinox Swiss Army Money Clip ($29) is Swiss made, compact and sturdy. It features an array of versatile tools and features including scissors, a nail file, a knife and of course a money clip. So you can keep your money and cards safe and secure in your pocket at all times. It’ll make a perfect gift for any man. Measuring 3 x 2.3 x 0.6 inches in diameter and made from real high-quality carbon fiber this is truly the money clip of the future! But while it might be futuristic in design it’s perfect for the man of today and will make a great alternative to boring old-fashioned wallets or even more traditional money clips. 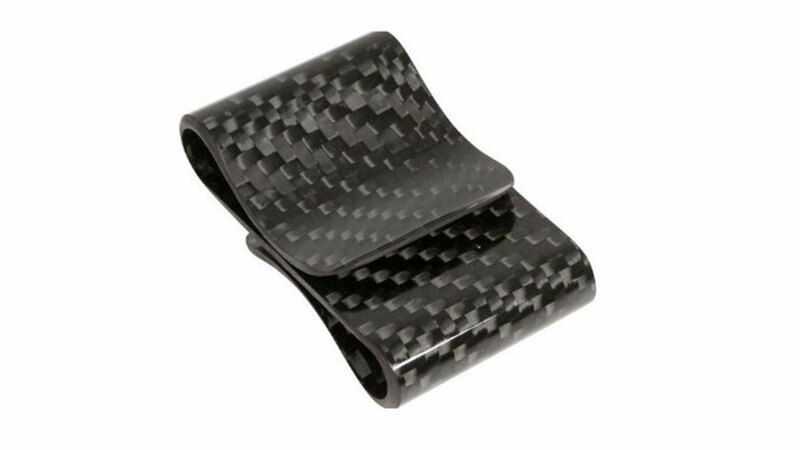 The Double Sided Carbon Fiber Money Clip ($20) has plenty of space to securely hold your cards and cash and would make a great gift for any man. Take your money organisation to the next level with the help of the Timberland Men’s Hunter Flip-Clip ($20). The genuine leather Italian leather gives this money clip a soft texture that ages well. Even though it’s slim, it features 4 credit card slots, 1 ID window and a money clip for notes. It has an embossed Timberland logo and comes in three different colors to suit your style. The wallet also folds shut to reduce bulk and slides easily into front pants pocket. An ideal accessory if you appreciate quality, and timeless design, from a well-respected brand. The Shinola money clip ($150) is a simple and elegant wallet that’ll make a great addition to any everyday carry arsenal. 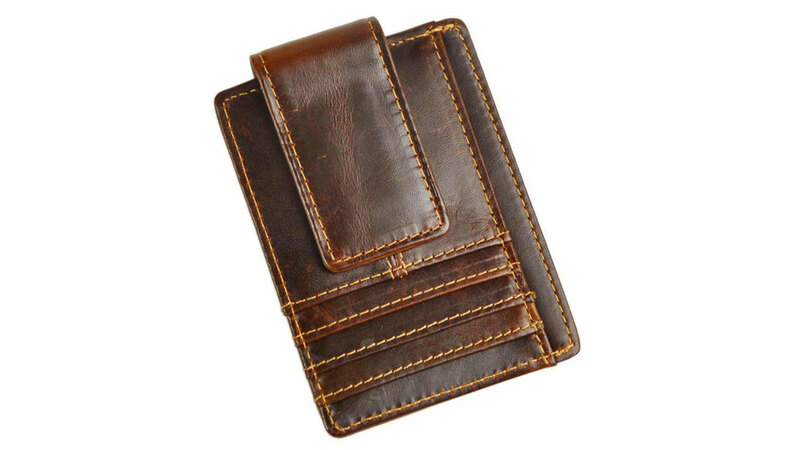 Made from high-quality leather it features two faille lined card pockets for storage. The currency holder section is leather wrapped and magnetic to hold notes and bills firmly in place. This wallet clip is available in four different leather colors. Each of which ages gracefully and pairs with your existing leathergoods. And, the slim design can be carried in pockets, laptop bags and backpacks alike. You’ll love this wallet clip for both its look and functional design. If you’re looking for a rugged money clip, Take a look at The Ridge RFID money clip ($72). Ridge made The entire wallet from 6061-T6 aluminium/anodized gunmetal. It has interchangeable elastic screws for longevity. The functional slim design holds between 1 and 12 cards without over-stretching. A metal money clip at the back secures notes and bills in place. RFID technology surrounds your cards, preventing your information from being copied by even the most powerful RFID chip readers. As a result, it has a lifetime guarantee. Discover a wallet clip that not only keeps your money safe but also protects your digital information from being stolen. The Distil Union wallet ($65) is perfect for the minimalist, style-conscious guy. It has a bi-fold design with RFID shielding to prevent your digital information from being stolen. The quality leather has hand-rolled edges. Making it one of the thinnest leather wallets on the market. Two inner slots hold your cards and an internal money-clip reduces bulk and keeps your cash secure. A Wally Pull-Tab allows for easy access to your cards.This stylish wallet is the perfect addition to your collection. The Orvis calvary money clip ($30) is small enough to slip into your front pocket. It has a strong magnetic clip encased in high-quality leather. This allows the clip to hold your notes and bills minimising the risk of loss. In fact, the magnet is so strong, it can hold up to 30 bills. It comes in a versatile brown leather with contrasting stitching. The perfect gift or treat for yourself. The Tumi Men’s Alpha Money Clip ($60) is the perfect blend of sports luxe and versatile design. Tumi made this clip using 100% ballistic nylon with durable lining. Leather trim provides a premium finish. Four card slots included in one side. On the other side, it has a money clip to secure notes and bills. The entire clip is slim enough to fit inside front and back pockets. RFID technology protects your digital information. When it comes to impeccable style, the Alpha Money Clip easily takes you from the office to an evening out. The Gucci Money Clip ($275) is an undeniable classic. Designed and made in Italy using high-quality sterling silver. On the front, the symbolic interlocking G motif has a textured edge. It can securely hold a wad of notes. It features rounded edges. And you can buff the highly polished surface with a soft cloth. If you’re someone who seeks out the finest style and craftsmanship, there’s no denying that this is the money clip for you. The Tom Ford Money Clip Wallet ($490) is stylish and effortlessly elegant. Pefect if you like leather goods that never go out of fashion. Tom Ford made this clip from high-quality black leather with gold metalware and printed branding. The bi-fold design opens up to reveal eight credit card compartments. Keeping your most essential information organised at all times. A gold money clip sits along the fold and minimises bulk. This wallet is small and compact and perfectly into laptop bags, backpacks or front pockets. If you’re looking for an accessory that embodies the professional and smart style of your wardrobe, then look no further. The Louis Vuitton Card Holder Money Clip ($355) is truly a statement accessory. The textured finish is made using high-quality coated canvas with a cowhide leather lining. It has an ultra-slim and compact design that fits comfortably into pockets and bags alike. On the back panel, a palladium-finish money clip has a ‘Louis Vuitton’ engraving. The clips holds up to 15 folded bills. This reduces bulk and is an effective alternative to traditional wallets.